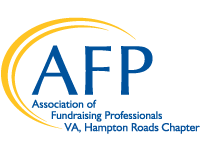 The Hampton Roads chapter of the Association of Fundraising Professionals (AFP-HR) has over 200 members and hosts monthly educational luncheons attended by more than 50 nonprofit development professionals, executive directors, board members and volunteers. In addition, AFP hosts a Fundraising Leadership Symposium as well as a National Philanthropy Day awards luncheon which celebrates philanthropy in Hampton Roads by honoring our region's philanthropic leaders. We are proud of the work our chapter is doing in our community. Our signature event, National Philanthropy Day, is a celebration of philanthropy - giving, volunteering and charitable engagement - that highlights the accomplishments, large and small, that philanthropy - and all those involved in the philanthropic process - makes to our society and our world. Our National Philanthropy Day luncheon in Hampton Roads has grown in attendance and sponsorship through the years. The celebration has become the signature event saluting philanthropy in Hampton Roads. At the 2018 National Philanthropy Day celebration, we boasted over 600 guests! Guests attending the event are truly the community difference-makers and decision makers as well as individuals who work daily to make our community a better place to live, work and donate. Proceeds from National Philanthropy Day help our AFP chapter provide quality programming for our members, scholarships for professional development opportunities for local fundraisers and networking opportunities. Please click here to register now for your sponsorship or to purchase tickets. Registration closed on Thursday, October 31, 2019 at 5:00 PM. For additional information please contact Abby Weber, Sponsorship Chair.